The Precision Xtra system offers intuitive setup and simple icon-driven menus that help simplify blood glucose monitoring. 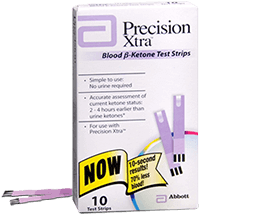 The Precision Xtra system tests both blood glucose and blood ketone all with the same meter using the Precision Xtra blood glucose test strips and Precision Xtra blood ketone test strips. DO I NEED TO CALIBRATE MY PRECISION XTRA BLOOD GLUCOSE AND KETONE MONITORING SYSTEM? 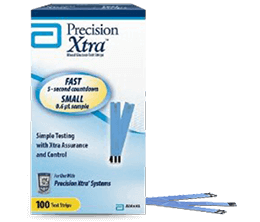 "No Coding" Precision Xtra test strips do not require use of a calibrator with each new box of test strips. However, you should confirm that the meter displays LOT 45001 (glucose test strips) or CODE 75001 (ketone test strips) when a test strip is inserted. If the correct LOT/CODE does not appear, please contact Customer Service 1-800-527-3339. HOW DO I PERFORM A BLOOD GLUCOSE TEST WITH MY NEW METER? Insert the three black lines at the end of the test strip into the strip port until it stops. The meter turns on automatically. The Apply Blood symbol and LOT number appear on the display screen. Check that the LOT number on the screen displays LOT 45001. Touch the blood drop to the white area at the end of the test strip until the test begins. Accurate results appear in seconds. HOW DO I PERFORM A BLOOD KETONE TEST WITH MY NEW METER? Insert the three black lines at the end of the test strip into the test port of the meter. Gently push the test strip in until it stops. The meter turns on automatically. Note: Check that LOT 75001 or CODE 75001 appears on the meter display window. If LOT 75001 or CODE 75001 is not displayed, contact Customer Service. Apply a small drop of blood from the finger to the white target area at the end of the test strip. The blood is drawn into the test strip. WHERE CAN I BUY THE PRECISION XTRA SYSTEM? 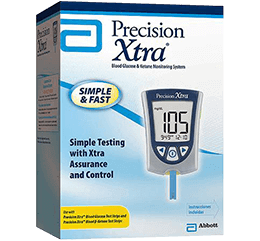 The Precision Xtra system is available at most pharmacies and locations where diabetes products are sold.